Recently a friend told me someone we both knew had lost her faith. I had a strange thought. I wonder if she is happy. You don’t usually associate losing one’s faith with happiness, yet most of the decisions we make in life tend toward making us happier, more complete and more satisfied. If one lets go of their faith, rather than struggling with it, has one made a considered decision that this is what makes sense for themselves, that this is what brings peace? Are they happier? I chose Houslander’s poetic The Reed of God, because many people mentioned how that book had touched them. It is a book about Mary, Jesus’ Mother and how we can claim her in simple yet profound ways as our teacher. Caryll makes Mary REAL. Yes, she’s a virgin, ever-holy, from an ancient world, and assumed into heaven, but to Caryll, Mary is someone we can imitate more easily than most saints. How little we know of Mary’s life details is a gift. What we have is essential in our walk toward holiness and pure love. 1) Mary reminds us we too are wed to the Holy Spirit, destined to be creative, employing with divine energy our unique gifts. 2) Her perpetual Virginity is a model of how to offer, wholly, our soul and body to be consumed with the fire of Love and changed into the flame of its glory. (In other words, virginity is something you “lose” through a sexual act, but something you can offer again and again through commitment to surrendering totally to God. 3) Mary shows we are all invited to “bear” Christ. She carried and birthed a divine human, into a sad, sweet world. We are called to re-birth our inner Christ and witness Christ being perpetually born in every single soul we meet. Just as the manger, with animal breath and the scent of manure in the air seems an unlikely place for GOD, our world’s darkest corners contain souls, like mangers, cradling CHRIST. Because we are (without exception in Houselander’s eyes) the Body of Christ, Mary’s guiding rule is two-fold. It helps us unite, to see that we are one in Christ, yet we are called to claim a personal and intimate life with Him. Mary had an intimacy with Christ like no one else’s. We can too. And she took on the yoke of a love which now unites us all. The book looks at Mary through three strong symbols. Mary is the reed, hollow, through which the Eternal love was to be piped as a shepherd’s song. That music of Christ can so naturally be played by even a child. Mary is the flower-like chalice into which the water of humanity was to be poured, mingled with wine, changed to the crimson blood of love, and lifted up in sacrifice. Mary is the warm nest, rounded to the shape of humanity to receive the Divine Little Bird. She is the home, the shelter of Christ. She was nearby often even when he was preaching, and she was certainly there walking with him to his death and awaiting him in the upper room after he rose. Emptiness, allowing the space for Christ to come to us. Advent – the seed planted, the waiting, the wondering, the excitement and the dis-ease of a big love growing inside our darkness. Just naming attributes of Caryll Houselander’s work and her view Mary as our teacher has been a joy. I know what you are all thinking. This is my first Sunday homily since I turned fifty. He should be a lot wiser than before. Don’t worry, I have the same expectation for myself. And I really think that I have made some progress. I have become much more efficient in how I sin. You see, when I was young, I thought there were many ways to sin. This action and that action were so numerous that they could not be counted. As I got a little older, I realized that while many actions constituted sin, they all sprung from a few motivations. Things such as pride, jealousy, self-hatred, anger and vengeance is how we sin. But now I have it down to one way to sin and I am going to teach it to you. You’re welcome. Hannah was a childless woman. She prayed that if God would give her a son, she would give him back to the Lord. Eli the priest saw that she was praying and asked her about it. When she told him, he said, “Go in peace, and may the God of Israel grant you what you have asked him.” She replied, ‘Think kindly of your maidservant,’ “ (1 Samuel 17-18). She did produce a son and offered him to God as she promised. When she left the temple, she sang this song. Do you see the echo in Mary? Mary would have known this story well. Luke mentions Mary 13 times in 5 different episodes, more than any other evangelist (twice in Mark and 6 times in Matthew) or Acts (3 times and never mentions her name). So Luke has a strong influence on our Marian theology. Luke’s literary style has a theme of presenting Jesus as our Savior; everything is a part of our salvation history, culminating in Jesus’ Ascension. Mary is a big part of that (Fitzmyer, Luke, the Theologian, p. 57). What did Jesus learn from his mother? Saying yes. Consider his baptism. Consider everyone who approached Jesus for help. Creating life. Mary birthed the Son of God. But she also taught him about God’s creation in growing food, etc, as being a woman in an agrarian society (Coffey, Kathy, Anthony Messenger, May 2013, p. 25). Like Mary, am I willing to open my heart and place my life in the service of God’s plan? What would it cost me? How might I more fully accomplish this? In what way does Mary teach us to be a disciple? What exactly does she teach us? How might devotion to Mary invite you to be a better disciple? If she is a model for us, what exactly does she model and what can you emulate, admire and imitate? She was actually named Miriam, after the sister of Moses. She led the grinding life of the peasant class, triple taxed from Rome, Herod and the temple. She would have lived in an extended family unit, where 3-4 houses of 1-2 rooms were built around an open courtyard. Food, cooking and animals were all shared in this common area. She would have spent up to 10 hours a day doing family chores. She probably was not the fragile picture of Mary we often see in art. She would have had a robust physique to withstand all she did. She probably didn’t know how to read or write (Maloney, R., America Magazine, “The Historical Mary”). As events unfolded around her, often to her surprise (and we have a God of surprises), she had to figure out continually what God was asking of her. Aren’t we asked to do the same? Hail! Holy Queen, Mother of Mercy, our life, our sweetness, and our hope! And after this our exile show unto us the blessed Fruit of your womb, Jesus. O holy Mother of God, that we may be made worthy of the promises of Christ. We know very little about Joseph. He is the foster father of Jesus and betrothed to Mary. He is from the line of David. He seems to be an upright man, considering divorcing Mary so as not to shame her. He is often pictured as being an older man. He had his own annunciation when an angel came to him in a dream and told him to see his marriage through. Like the Joseph in the Old Testament, he paid attention to his dreams. Once Jesus was born, Joseph protected his family by fleeing to Egypt with them. What can we learn from this man connected to God breaking into our history? A betrothal was a binding agreement, lasting 1 year. The couple would be known as man and wife, but the marriage was not consummated until the end of the year. It could only be terminated in divorce. Going against this agreement could have meant death for Mary. Joseph was told Mary was with child through the action of the Holy Spirit. We have a Christian view of what Holy Spirit is, but Joseph would have had a Jewish interpretation. What is that? Holy Spirit is who brought God’s truth to humanity, telling the prophets what to say and telling people what God wants of them. Holy Spirit allowed people to recognize that truth when they saw it. Holy Spirit is connected with the work of creation (moving across the waters). Holy Spirit is connected with re-creation (Ezekiel’s dry bones). 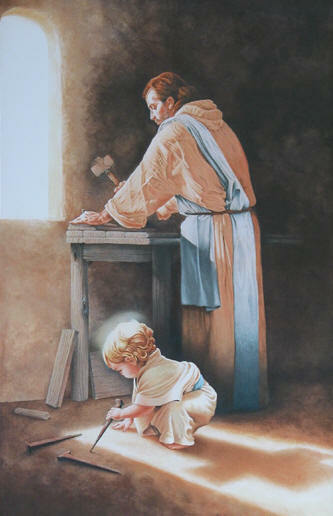 We know Joseph was a carpenter (Mk 6:3, Mt 13:55), and sons often took on the same role as their parents. The name ‘carpenter’ doesn’t exist in Hebrew, so he would have been known more as a ‘cutter’ or ‘worker of wood’. A rural carpenter would have been indispensable to the town where he lived. In addition to building homes, they would have made cabinets, carved, and made wheels, yokes and plows. Roofs were flat, so making a house would have involved laying down beams and covering them with reeds. If there was an upstairs, the staircase would be outside. For all of these projects, the carpenter would have had many tools and be flexible enough to work on whatever came into his workshop that day (Daniel-Rops, Henri, Daily Life in the Time of Jesus, p. 241-3). Joseph is often depicted as an old man, but we actually don’t know how old he is. The marriage custom at the time was that a young woman, essentially at the age of puberty, would be given to a man, usually several years her senior (Rolheiser, R., “Joseph and Christmas”. If Mary was 13 years old, Joseph may have been only 16-18 years old. What difficult decisions he had to make at such a young age! What can we learn from Joseph? He teaches us how a person can be a pious believer, deeply faithful to everything within his religious tradition, and yet at the same time be open to a mystery beyond both his human and religious understanding (Rolheiser). Isn’t this what we are all challenged with at Christmas? 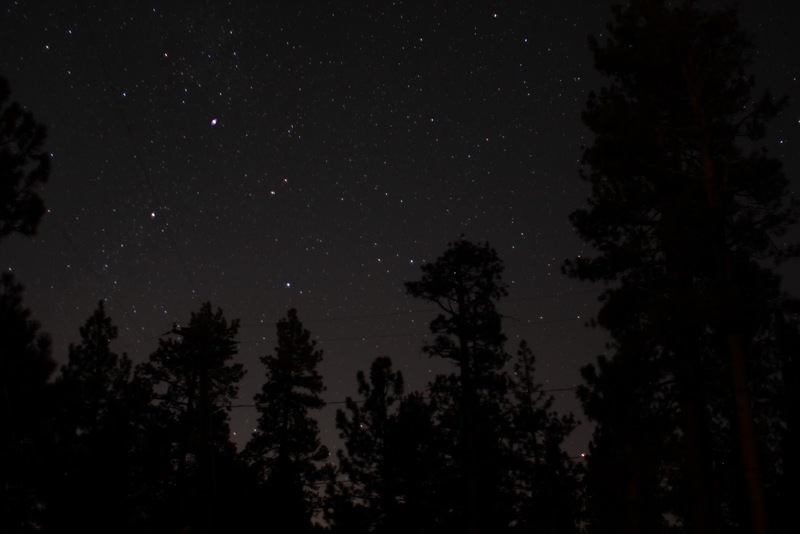 Joseph seems to live a life of quiet service to God, a life almost completely unknown to us. Today many Christians lead lives of hidden charity – a kind deed here, a few hours of service there. All of these quiet acts mark the Christian lifestyle. 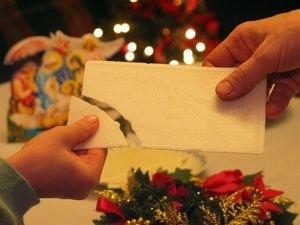 Even if no one else sees those deeds, God does (Catholic Update Dec. ’09: “The Holy Family”). Joseph teaches us humility. Tradition holds that Joseph most likely died before Jesus started his ministry. Jesus must have wished for his counsel during those years, since he learned much about his faith from Joseph. Mary must have wanted his support at the Crucifixion (Cath. Update). Jesus and Mary knew grief through Joseph. Take some time with Joseph this Advent!